An animal-rights group has filed a lawsuit against New York City and several Jewish institutions, including the central Yeshivas Tomchei Temimim and the NCFJE, in a bid to force them to crack down on the practice of Kapparos by Orthodox Jews on Erev Yom Kippur. 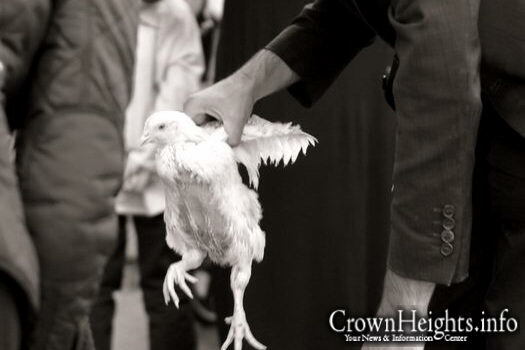 The Alliance to End Chickens as Kaporas has filed suit against the city, the Health Department and several rabbis, seeking enforcement and fines to end the ritual. 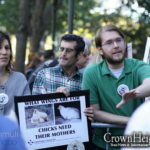 Last year, feathers flew in Brooklyn when an animal-rights zealot tried to bust up the ritual by stealing a coop full of chickens. Click here to view a copy of the lawsuit. Their concern is for the chickens. It wouldn’t matter if any other religion was doing kapparos. This group would still protest the same way. They should then shut down all butcher and poultry shops and slaughter house and all pet shops and forbid handling of any animals as pets or in ranches and farms etc. Instead of just dismissing them completely, take a look at what’s really going on. Yes, we have a strong tradition to do kappores with chickens. BUT, we have actual halachos about treating animals right. Can you really justify the way these animals are treated during kappores? I am not talking about the actual shechting. Look at how the animals are stored. How they are treated. How many die from the deplorable conditions. We have a mitzvah to treat animals well. How can anyone justify this? If you want to do kapparos with chickens, drive out to a farm, buy a chicken, gently shlog it right then and there. I’ve done it that way when I was able and it is a completely different experience. The right way. so what did you do with the sweet innocent little chicky? Did you release it back to the flock? Put in in your truck till you found a schochet? Or maybe you (horrors!!!) schected it yourself? Yes, thank you. 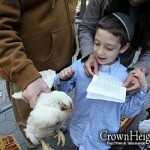 I doubt that kapparos were done with thousands of chickens on public streets at any other time in Jewish history. This bloody custom does not belong in supposedly civilized city streets. Go out of the city and do it at a farm or slaughterhouse if the custom is so dear to you. It is certainly no mitzvah to impose these very unpleasant sights and smells on anyone, but the opposite. Enough is enough. I pray for the success of this lawsuit, for the sake of animal rights, and even more, for the sake of the human rights of those who live in the city and against their will have had to endure the discomfort and repulsion this custom exposes them to. So we have the yevesektzia among us? I pray that you can see through your thin veil of your egregious hatred. That you may see the true beauty of God and his holy Torah. More sensitivity is needed on both sides, including in my previous comment, but I was affected by reading above the first two commenters, and I replied in kind, in particular to the one who signed himself “sickos.” Is that what Torah is supposed to teach us, to be so insensitive and condemning of others who in many ways are to be commended for being very kindhearted and exemplary people? I would appeal too to those supporting the custom, and the way it is practiced in the city, to consider how the sight of this affects very many others in a very negative way. Is it really worth it? There are many stories of Tzadikim and Rebbeim telling how they hastily set aside important customs in order not to Heaven Forbid cause embarrassment to another person, which would violate other direct Torah commandments. Is this custom any better, that for the sake of keeping this custom at all costs and in any way at all, that it should be more important than all our other duties to be exemplary citizens and respectable to all our neighbors, especially in this great country which grants and guarantees religious liberty for all? They don’t care about the chicken. When you stop kaporos in the city they will go after you in the suburbs, and then on the farms. You/we are their problem. 1) slaughterhouses ?! why are they keeping their eyes closed on how all other non-kosher meat producers are processing. 2) to places where they sell crabs etc and how they treat them. They know they will be thrown out when they get there. i dont think they will really do it. the are chicken. ok, #5 and #6….you really do make a very sensible point there. did they ever visit a zoo? the group of voodoo people who horrifically practice “Santaria” with chickens! They only pick on us Crown Heights Yidden because they know we will engage in a dialogue instead of ignore them like a gnat buzzing around. Animals are killed just for fun in this country. These chickens feed people. What’s next? Did this “issue” happen last year already and now they are recoming back with it? they didnt win last year, Hashem will make sure they wont win this year or any year either! It is a problem doing it on streets that are not jewish, as it is very disturbing to non Jewish neighbors..that is true. However, the whole issue is that people are seeing something public, what they would never see in a slaughterhouse, which is much much worse. They see chickens all nice, and clean and wrapped so fresh and tasty looking, and like all people today, do not really want to be exposed to how it got there…So taking a lobster and scalding it alive in boiling water is fine, or chopping fins off of sharks for shark soup is fine, and aborting a baby at 24 months is fine,, I am sure you get the point. If they are successful at banning this, you can bet bris is next, and then shichta..and then….I guess, my friends it will be time for us to pack up and leave America. So, in conclusion, my opinion is to hear what valid points they are making, and improve how we do kapporos….but make no mistake about it…the anti semitism is at the root,and no love of chickens. While I very much support humane treatment of animals, I always had the impression that PETA is not a simple watchdog organization — rather, a left-wing group pushing not only a secular, but overtly anti-religious agenda. They would rather we not have any rituals altogether, since we uncomfortably remind them of a Creator. Certainly, I’m all for providing the chickens with comfort — and I’ll be the first to report cruelty to any creature. But I will not deal with any group so blatantly hostile to tradition — or the notion of tradition. if G forbid they can make a case about kapparos then next is shechita!! These people are vicious, they will stop at nothing till they carry out their agenda, and that is to incarcerate Rabbi Hecht. They didn’t stop with SMR, they pursued him till he was torn from his family and incarcerated, that’s when they were finally satisfied. They acted then as a vicious pack of wolves not being satiated until having ripped to shreds it’s prey. The same is unfolding right in front of our eyes. This will not stop unless the pack of wolves will have ripped it’s new prey..Rabbi Hecht. Therefore, as we internalize this and understand this, it is prudent for us to have Kappores done in a non public place. The Rebbe never made a Mivtza of this to be done in the Reshus Harabim as he did for the lighting of the Menorah. For Chanukah we were specifically given a directive by the Chachamim to have it placed in a way that will bring about the Mitsvah of Pirsumei Nisa. This isn’t the case for Kapporos. We will guard our traditions and Minhagim and keep them to the fullest, but let’s do it on private property hidden from the public view, as it’s done everywhere else in Jewish communities. Much before gimmel tammuz till today, according to the Rebbe’s tishrei videos the chassidim always did it in public view. its more like: they are making a problem when there is no problem. btw in boro park kapparos is done in public view as well.